Peach, Yes please tell us something. So glad you made it. TK and Rachel are coming up soon they said about 20 mins ago if anyone is lurking and interested. I'd say about 8:15-8:30. 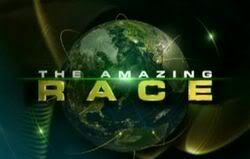 I just heard a little bit ago that the winners of The Amazing Race are going to be on the Regis & Kelly show on Tues. I don't know if Phil will be on. I don't remember who else is on except for Ringo Starr. Absolutely! They were so nice and genuine. From Kynt & Vyxsin, Jennifer and TKR, this TARCon was full of nice people. I don't have references to other TARCons, but everyone was so accommodating and nice. Well, except for Jorge at Puglia's passing the collection plate after interrupting lunch and that crazy woman putting herself in every picture. Oh Regis...did you have to keep calling her "Rosalie"?? You're kidding ? Maybe its time for Regis to retire? Reege: So we welcome the uh.. winners of The American Race, TK & Rosalie! Kelly: You guys were great! Reege: Yes, you kids were something, running around the world. Did you happen to think of my friend, Dean Martin? Kelly: Oh, there's Reege stuck in the 1950's again. TK: I wasn't even born then. Reege: Ok, never mind Dino. What about Sammy Davis, Jr.? Reege: Whatever. During the race, did you have to do any swimming? TK: No, not this season. Reege: Why not? Didn't you have to do the triathlon or something like that? Kelly: Reege, didn't you watch the show? Reege: I haven't watched TV since they canceled Millionaire! Those ABC bastards! Reege: From your mouth to God's ears! ABC ruined that show! Reege: Race! Schmace! Millionaire should be back on the air! Kelly: We've run out of time, so sorry, TK & Rachel. Congratulations on winning the race. OMG you are TOO funny ..I am literally rolling on the floor laughing! You got me AGAIN Ken! I liked rachel's hair straight. lmao why the hell is Regis calling her "rosalie"
Because of her last name Michael .. I have the same problem with my name since I'm a Rose Ann >> example, without giving away my last name, "Rosezinnia"
Because Reege is 90 years old and is practically senile.